Buddha-in-a-Bag. Another great gift idea - exclusive to Patinkas! 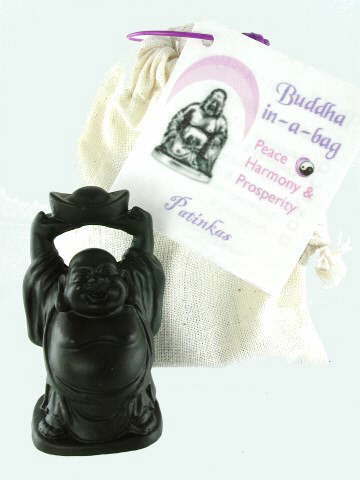 Lovely quality matte black Happy Buddha resin figure in a muslin bag, complete with tag (the reverse of the tag lists the various Buddha 'stances' or positions by name, and has a tick by the one you have selected). There are six to choose from: Abundance & Wealth (Money), Longevity & Good Health (Health), Good Fortune & Happiness (Luck), Happiness & Celebration (Happiness), Emotional Wealth & Love (Love), Prosperity & Joy (General Abundance) or you could leave it to fate and take pot luck! The muslin bags are hand-made by a family in India under the fair trade scheme. Abundance & Wealth Emotional Wealth & Love Good Fortune & Happiness Happiness & Celebration Longevity & Good Health Prosperity & Joy Take pot luck!